Join us at Woodhorn Museum this summer for A Grand Day Out! Take part in a fantastic summer of family art activities in the newly re-opened Woodhorn Colliery Cage Shop. 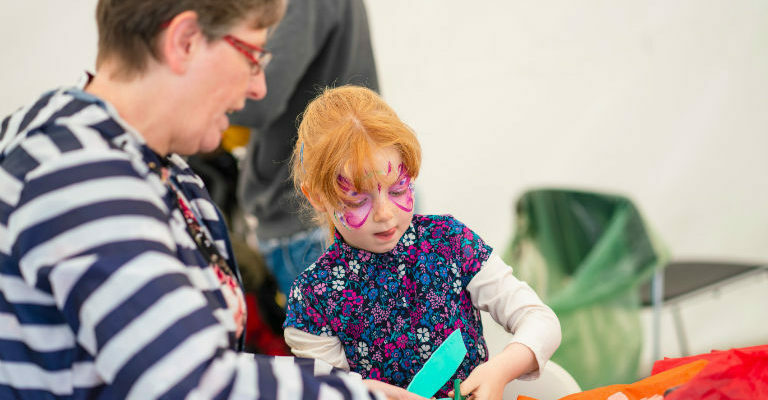 There’ll be a changing programme of art activities inspired by The Pitmen Painters and our coal mining community heritage, with something different to create each time you visit. Join us for the start of a miner’s shift and find out why miners had a tally and a miner’s lamp and why they were both so important. Make your very own personal lamp or tallies with artist Louise Bradley and Woodhorn staff. Leave one tally on our wall and take one home. Many miners including the famous Pitmen Painters kept their own pigeons. The Cage Shop becomes a pigeon cree and you will help artist Louise Bradley and staff to create a flock of colourful collage pigeons. Every miner and their family grew their own vegetables, either in the yard, or on an allotment. Artist Paul Merrick and staff are going to build Woodhorn’s first allotment and we need you to help with the vegetables – make your own awesome leeks, perfect peas or terrific tomatoes. Brass bands are integral to life in mining communities. Be part of Woodhorn’s new brass band, The Oom Paa Paas. Make your own instrument with artist Paul Merrick and Woodhorn staff and see who can make the best tunes! The making of colliery banners and posters was an important tradition in mining life as can be seen by Woodhorn’s amazing collection. Many of the original Ashington Group artists painted the banners that are now on display in the Museum. With artist Theresa Easton and Museum staff, you can make posters or mini placards with your own message or slogan. This event is part of the ‘Pitmen Painters: Resurfacing’ summer season at Woodhorn Museum which celebrates and explores the story of Ashington’s Pitmen Painters. The ‘Pitmen Painters: Resurfacing’ summer season at Woodhorn Museum has been made possible through the support of Northumberland County Council, Arts Council England, The Ashington Group Trustees, Ashington Town Council, Newcastle University and The Arts & Humanities Research Council.